Beautiful Traditional Chalet in National Park Hohe Tauern for Mountain Holidays. ** Now with free Wifi!! **. Chalet Kolbnitz is a traditional Austrian detached house with garden on the sunny side of the beautiful Mölltal valley in Kolbnitz, National Park Hohe Tauern. The spacious house features sleeping for 6 in 3 bedrooms (no bunk beds/sofa beds), a bathroom with roll top bath, a shower room, 2 toilets, a kitchen with breakfast table and a lounge/diner with corner sofa & dining table. Two bedrooms have balconies with great mountain views, while in summer there is a wood decked terrace where you can enjoy the view with a glass of wine at the table. The central location in the Mölltal valley is perfect for summer and winter holidays amongst the lush rivers, lakes and mountains. It has two funiculars for hiking in the mountains, a rafting centre, a horse riding centre, tennis courts, a swimming pool & restaurants/bars, also nearby is Millstätt with its beautiful lake & golf course. In winter there is a village ski lift & the ski resorts of Ankogel & Mölltaler Glacier (all year skiing, 20mins). We frequently improve the house, recent additions include: a new roof, new bespoke made wooden child stair gate, child friendly balustrade upstairs, re-laid and repaired terrace, new dishwasher, new cooker, new washing machine and a new hot water heater. Airports near Kolbnitz: Klagenfurt - 98km, 1 hour drive. Ljubljana (Slovenia) - 132km, 1.25 hour drive. Salzburg - 159km, 1.5 hour drive. Graz - 224km, 2 hour drive. Trieste (Italy) - 226km, 2 hour drive. Vienna - 400km, 3.5 hours drive. Car hire: In addition to the usual car hire pick up points in Austria (airports, etc) car hire outlets in Slovenia and Italy usually include driving in Austria at no additional cost, but please check with your car rental company before booking. Driving to Kolbnitz is straight forward, leave the A10 Motorway and take the road towards Grossglockner for 10 minutes, there are no hair pin bends and the roads are cleared of snow in winter. Getting to Kolbnitz by train: Take an Intercity (IC) train to Mallnitz, Spittal or Lienz then catch the local train to Kolbnitz. Various games, plus Singstar with microphones! More photos are available on request, just send me an enquiry. The most regular visitors to Chalet Kolbnitz? We are a travel-loving family of five and almost never go to the same place twice. But we are regular visitors to Chalet Kolbnitz; we’ve been every year for the last four years and have just booked our fifth! It’s easy to say why we keep coming back: the Chalet is a beautiful and functional house in a stunning area with lots to do. In the village itself there is a fantastic (and weirdly deserted) swimming pool, a small supermarket, a funicular railway (with choice of mountain) and a few places to eat. Kolbnitz is also well-connected and it is easy to explore the local area; there is walking, swimming, historical buildings, museums and other tourist attractions. There are also cycling and running trails accessible from the Chalet. The house functions perfectly for our young family. There is plenty of space – all the bedrooms are a good size and the kitchen is a great space for cooking / eating family meals – and the house is clean and well-kept. Albin, who looks after the house, is very helpful indeed; he and his wife also do a super job on the garden, which our kids love exploring. We’re also fans of the woodburner and have spent many a happy night toasting ourselves in the lounge. So we can’t recommend it highly enough – it suits us perfectly and we plan to keep coming back! Thanks for taking the time to write this great review Fraser. I love that you and your family love the house as much as we do! De mooie, comfortabele woning in Kolbnitz. Het verblijf in de woning zandlach 40 is ons goed bevallen. De ruimte in het huis was geweldig. De keuken met al haar materialen was voor een kookliefhebber een genot om daar een maaltijd te bereiden. Naast deze ruimtes binnen was het buiten genieten. We hebben vaak ontbeten op het terras, een beter begin van de dag kun je je niet wensen. Vanaf het terras had je een mooi gezicht op de omgeving met als hoogtepunt de kleine Danielsberg, een wandeling naar dit uitzichtpunt is zeker de moeite waard. Vanuit de woonkamer heb je een prachtig uitzicht op de bergen. Naast de mooie, comfortabele woning is er in de omgeving van Kolbnitz genoeg te doen. De reisseckbahn naar 2200m is de moeite waard. Vanaf dit punt heb je een schitterend uitzicht over de stuwmeren. Daarnaast starten er mooie wandelingen en is de reisseckhutte een aanrader om te genieten van een specialiteit uit de omgeving. Voor ons waren de 2 weken zo voorbij en hadden we graag nog iets langer willen genieten van al het mooi's van deze omgeving. I'm glad you understand English, as my Dutch isn't up to much! Thank you for the great feedback, it's great to hear about the time you spent at the house. My wife and I spent a wonderful holiday at Chalet Kolbnitz. We spent a week there with 4 friends around new year's eve. The Chalet is nice and in good shape, with everything necessary to cook and relax. The location in a peaceful village is nice, with view on the moutain. Supermarkets, gasstations, and the Malnitz/Ankogel ski resort are easily accessible by car. We'd recommend this place. Thank you for the review Charles, new years eve is great fun in Kolbnitz isn't it? I was there last year and I've never seen so many fireworks! Have a great year. Im September 2010 erlebte meine Lebensgefährtin und ich zwei sehr erholsame Wochen im Chalet Kolbnitz. Das Dorf Kolbnitz ist zentral gelegen, Sehenswürdigkeiten wie die Städte Spital. Villach und Klagenfurt oder der Kärnter Nationalpark, der Millstädter See mit allen Wassersportarten, sind schnell erreichbar. Zwei Bergbahnen sind in Kolbnitz, davon eine nur 5 Minuten vom Haus entfernt. An den Endstationen sind sehr schöne Bergwanderungen unterschiedlicher Schwierigkeitsgraden möglich. Im Dorf ist auch ein Lebensmittelgeschäft für den täglichen Bedarf vorhanden. Das geräumige historische Holzhaus mit einem schönen Kachelofen hat sehr viel Charme. Man brauch trotzdem nicht auf Luxus wie DVD-Player, Fernsehen etc. zu verzichten. Auch die Küche ist komplett ausgestattet. Sehr schön ist auch der Garten mit den Apfel- und Zwetschenbäumen, die uns sehr gut geschmeckt haben. Auf der Sitzecke hinter dem Hause hatte man einen sehr schönen Blick und konnte die Nachmittagssonne und den Sonnenuntergang genießen. Insgesamt hatten wir zwei sehr schöne, unvergessliche Wochen in Kärnten. Wir werden bestimmt wiederkommen. In September 2010 my partner and I spent two very relaxing weeks in Chalet Kolbnitz. The village Kolbnitz is centrally located, places like the city hospital. Villach and Klagenfurt and the Carinthian National Park, Millstaedter lake with all water sports are easily accessible. The two cable cars in Kolbnitz are only 5 minutes from the house. At the end stations are very beautiful mountain walks of varying difficulty levels. In the village there is a grocery store for your daily needs. The spacious historic wooden house with a beautiful traditional heating stove has lots of charm. One need not want on luxuries such as DVD player, television, etc. The kitchen is fully equipped. Very nice is also the garden with apple and plum trees, we tasted the fruit and they were very good. In the sitting area behind the house there is a very nice view and we were able to enjoy the afternoon sun and sunset. Overall, we had two very beautiful, unforgettable weeks in Carinthia. We will come back for sure. i'm so glad you enjoyed your stay so much, thank you for taking the time to write review. you're welcome back anytime. 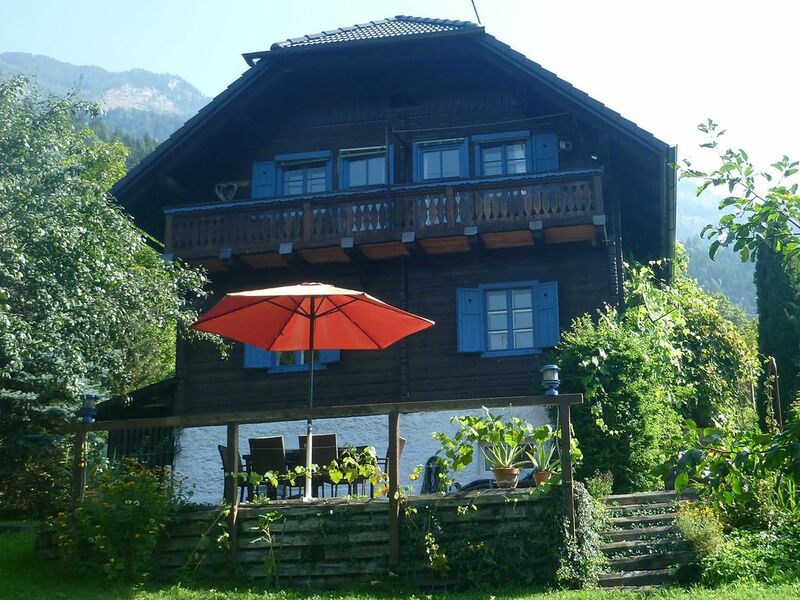 My fiance and I stayed at Chalet Kolbnitz for a week in late July 2010 and it was lovely! The location is brilliant, at the heart of a traditional Austrian village with its local amenities, but with easy access to some of the main attractions in Carinthia National Park. There's lots to do in the area, with Lake Millstatt, the river Moll and all its watersports, plenty of lovely walks and a mountain railway literally 5 mins from the house! The house itself is very spacious and has everything you need, including little luxuries like a playstation and dvd player, and a really useful pack giving information on all the things to do and see in the area. The kitchen is well equipped and the beds really comfortable. The garden is large with its own fruit trees (the apples were good!) and gets the sun for most of the day. Sitting on the decking watching the sunset over the mountains every evening was a real treat. The house is clean and well maintained and the local who looks after the house for the owners was friendly and helpful. We hired a car for the week which I would definitely recommend to make the most of the local area and in particular the nearby panoramic mountain roads, however there was a rail station and bus stops in the village so public transport could also be an option. All in all we had a really relaxing and memorable week. The house had absolutely everything we needed and more, and it proves that you don't have to be a skiier to enjoy the Austrian Alps! Beautiful - Thank you. So glad you both had a great time at the house, we try to make it as great as possible. Albin (who looks after the house) is a star isn't he? Last week we bought a new oven and hob for the house too so life is even easier. Let us know if you think there is anything we can do to improve the house for future guests, we'll do our best to arrange it. Hope to see you back at the house someday. Tolles Haus, sehr nette Verwalter. Ofenfeuer brannte schon bei unserer Ankunft, die Verwalter wohnen gegenüber, sind sehr nett und hilfsbereit. Kolbnitz is a beautiful village called 'The Heart of Carinthia' due to it's central location in the Mölltal valley, it is perfect for exploring Carinthia's beautiful rivers, lakes and mountains. The walking trails of the National Park Hohe Tauern start in Kolbnitz and extend into the mountains via two funicular trains that lead to the peaks of Kreuzeck(1211m) and Reisseck(2245m). Both offer breathtaking views, great walks and places to eat and drink. Summer ski is only 20 minutes away on the slopes of Mölltaler glacier(3122m), while Lake Millstat is a great place to swim, walk or sail and boasts a championship 18 hole golf course and is a 20 minute drive. In winter Kolbnitz is the perfect starting point to explore the regions ski and snowboard resorts inc. Ankogel, Mölltaler Glacier, Goldeck, Katschberg, Nassfeld and Grossglockner. Other Kolbnitz facilities include a rafting centre, clay tennis courts, a swimming pool, a horse riding centre and places to cycle and fish. Ski: The closest resorts to Chalet Kolbnitz are Ankogel and Mölltaler Glacier, both are served by a free ski bus during the winter season, while the glacier offers all year round skiing. The experienced skier will head for the Ankogel gondola and Gross Grossglockner for long challenging runs, while snowboarders and intermediate skiers will love the wide carving slopes and boarder cross park of Mölltaler Glacier. Skiing Locations.... Kolbnitz, the village lift, 4 surface lifts, plus night skiing on Fridays and Wednesdays 6-9pm. Ankogel 2600m, 35km of runs, 20 minute drive (or ski bus) open mid December till April. Mölltaler Glacier 3122m, 53km of runs, 20 minutes drive (or ski bus), open from mid-June to mid-May. Goldeck 2142m, 30km of runs, 20 minutes drive, recently renovated, open mid December till April. Katschberg, 2220m, 70km runs, 40 minute drive. Nassfeld, 2020m, 110km of runs, 65 minutes drive. Deposit: 350.00 € - Refunded after your stay Final cleaning: 45.00 € Towels / bed linen: 0.00 € - included Local tourist tax: 1.15 € per adult per day. Electricity: 700 kw/h free. 1€ per 10kw/h thereafter Wood: 0.5 cubic metres free. £100 per cubic metre thereafter.